Wycliffe Golf & Country Club Host Ninth Prep Tour Event of 2017! 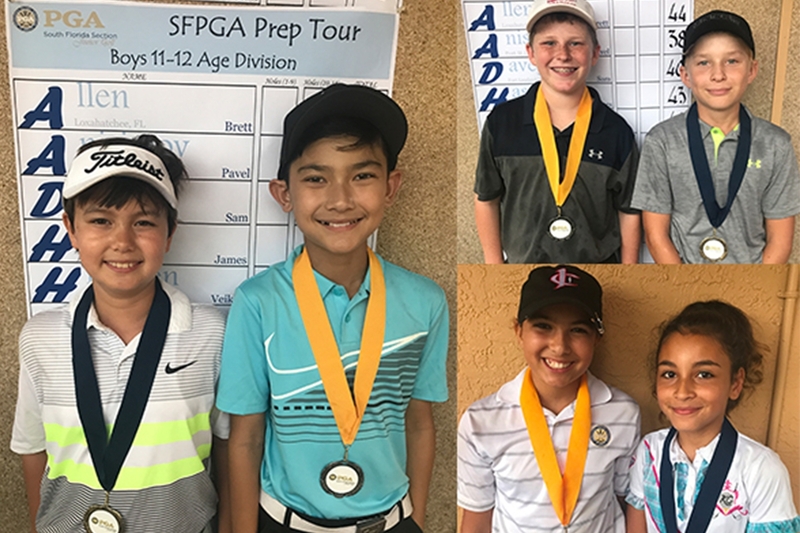 Wellington, Fla. – Saturday, October 14th, the South Florida PGA Junior Prep Tour presented by The Honda Classic held the ninth Prep Tour Event of the 2017 season at Wycliffe Golf & Country Club on the west course. The field was comprised of 63 players aging from 9-18 ready for a great day until the storms rolled in and play was suspended. After a long delay featuring heavy rain, it was determined that the course was unplayable, and only those who had completed an entire nine were able to be scored. Three of the six divisions competing in the event were awarded, while the others unfortunately were not. Tristan Wieland of Jupiter took home the boys 9-10 age division with a 1-over par 36. Pembroke Pines native Eric Nguyen took home the runner-up spot in the boys 9-10 age division with a 2-over par 37. Pavel Anisimov of Port Saint Lucie captured the boys 11-12 age division with a 1-over par 38. Fort Lauderdale native Sam Davey took home the runner-up spot in the boys 11-12 age division with a 3-over par 40. Rachel Gomez of Pembroke Pines took home the girls 11-12 age division with a 4-over par 39. Hobe Sound native Morgan Pichler took home the runner-up spot in the girls 11-12 age division with a 5-over par 40. The tenth and final Prep Tour event of the season will be held November 12th at Jonathan’s Landing Golf Club at Old Trail. The South Florida PGA Junior Prep Tour is proudly presented by The Honda Classic and supported by Antigua, Don Law Golf Academy, Florida Institute of Performance, Junior.Golf, Lipman, Palm Beach County Sports Commission, Pukka, Skimp, and TLink.